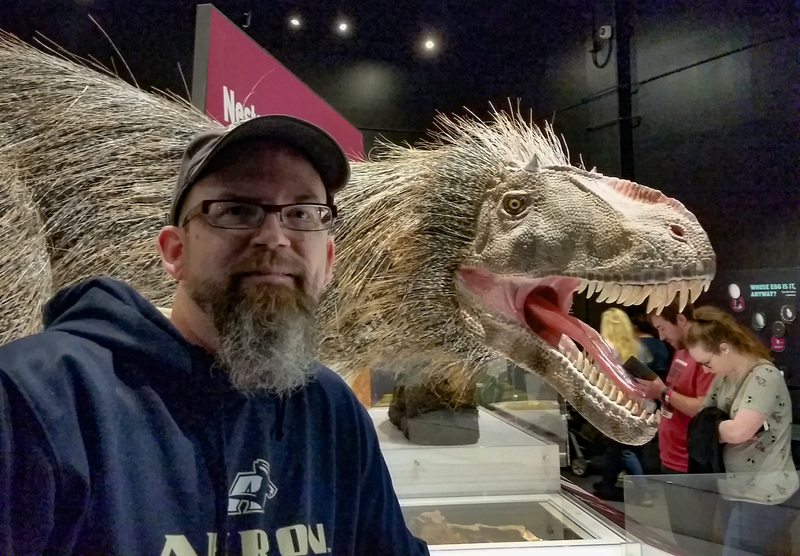 A few weeks ago I criticized Ken Ham and several of his Answers in Genesis’ colleagues for stating that some living birds have teeth like those of fossil birds. I pointed out that none of the 10,000 living bird species produce true teeth. However, there were some birds that lived alongside dinosaurs during the Cretaceous Period that produced and used true teeth. I was reminded of this fact last Saturday when I took my family to the American Museum of Natural History dinosaur and ancient bird exhibit at CoSi in Columbus, Ohio. It’s a fantastic new exhibit that puts the latest paleontology discoveries on display though we had to pay admission to CoSi to gain admittance. 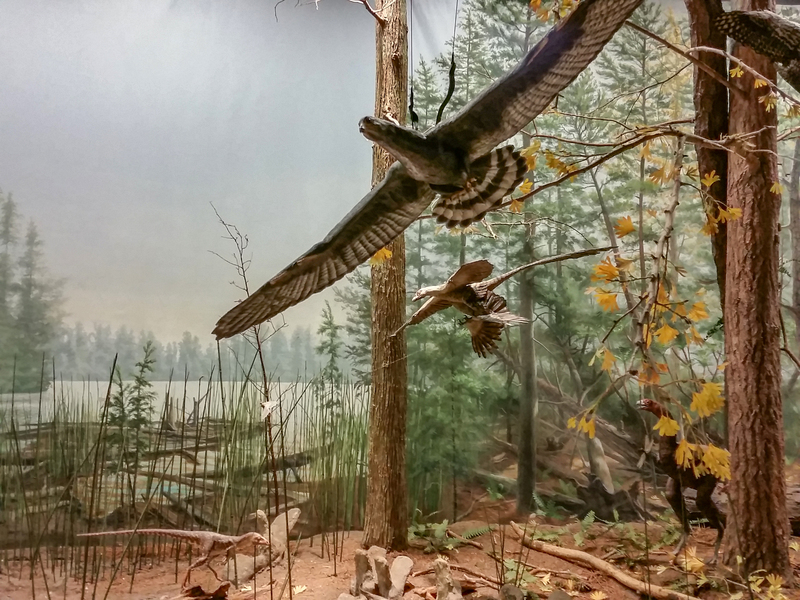 While walking through the exhibit I took a number of pictures, primarily of ancient birds and feathered dinosaurs. One of the latter species was a feather-covered velociraptor (a small theropod-type dinosaur made famous in the film Jurassic Park). Right as I was preparing to take a picture I spotted the Louisville Cardinal mascot walking past my subject. Apparently the mascot was there along with several other NCAA mascots to participate in a photo-shoot for the NCAA women’s basketball final four tournament that was being held that weekend in Columbus. Louisville Cardinal mascot walks past a feathered velociraptor at the American Museum of Natural History exhibit at CoSi in Columbus Ohio. When I got home and looked at the picture I noticed, for the first time, that the Cardinals mascot clearly includes enamel teeth as part of the outfit. Cardinals, like all modern species, do not have teeth but this mascot is so familiar to many people that it would be easy for someone to believe that cardinals do have teeth if they had never stopped to look at one closely. But all kidding about anatomically incorrect college mascots aside, it was the fossil birds and other feathered dinosaurs on display that I was thinking about while at the museum. Much of what was on display was related to topics that I have discussed on this blog in the past month. In particular the displays had much to say about the presence of birds and their diversity at the end of the dinosaur age. They man in the background should watch where he uses his cell phone:-) I am posing in front of a Yutyrannus dinosaur. This is the largest theropod dinosaur that has been found with direct evidence of feathery plumage over much of its body. This animal is classified in the broad group that includes Tyrannosaurus rex though there is still no direct evidence the latter had any feathers. Location: American Natural History Museum exhibit at CoSi in Columbus OH. Photo by Joel Duff. No expected? Why? Mr. Lacey clearly believes evolution normally proceeds linearly with replacement rather than as a bifurcating process. This is one of the most common misconceptions of evolution. Nothing about evolutionary theory says that we shouldn’t expect to find all three types of creatures living in the same time period. If Lacey were to take a look around the American Museum of History exhibit as CoSi he would will clearly see that evolutionary biologists are not surprised or embarrassed to find theropod dinosaurs, toothed and feathered intermediates that share characters with birds and dinosaurs, and beaked birds that have a suite of characteristics we associate with modern birds today all living at the same time. Why? Because “modern” animals can live side-by-side with descendants of their ancestors that have retained more characteristics of the ancestor than they may have. For example, all domestic dogs are descendants of wolves but wolves are alive today even though the wolves alive today are probably very similar to the animals that gave rise to domestic dogs. We are not shocked to find remains of domestic dogs and wolves that are 100 years old and thus living at the same time. Likewise, birds with teeth can live alongside birds with beaks or ostriches can be found living beside modern birds even though their ancestors are from a more ancient group than modern birds. The common ancestor of both beaked and toothed birds may have had teeth but one descendant lost their teeth while the other didn’t just like one descendant of the common ancestor of wolves and dogs retained all of the features of wolves while other descendants of that same ancestor now look like Dalmatians. Unfortunately, the remainder of Lacey’s article about “modern” birds found in the Cretaceous is similarly filled with misunderstandings of either evolutionary concepts or the terminology used by scientists in the field. Most importantly, the word “modern” has multiple meanings which play an important part in the interpretation of some scientific literature. In this case it is important to remember that the word “modern” refers to all birds in the entire Neornithes group and not to particular families of birds that we recognize today. “Modern” birds have all the general attributes we associate with the whole group of living birds except the ratite birds such as ostriches which are in a different group and not considered “modern” birds despite being alive today. I would recommend that Lacey take a trip to Columbus and spend some time at this exhibit. It would be helpful to see some of the characteristics of ancient birds and what they have in common with modern birds and where they differ. I want to also remind Lacey and my readers that fossil birds from the Cretaceous are very diverse and much more common than most people realize. Our knowledge of bird and bird-like dinosaurs has increased dramatically within the past decade and hundreds of new fossils will be described in the next decade. Young earth creationists have found explaining feathered dinosaurs very challenging. There are as many opinions among YECs about how to classify these odd animals as there are YECs that have considered them. I have written several times about the difficulties that YECs have had in sorting out the fossil evidence and placing these animals into discrete bins of “dinosaurs” or “birds.” A few YECs still attempt to deny that any dinosaurs had feathers of any type. Others try to lump every fossil with evidence of feathers together as a bird even if most other features of the same animal say “dinosaur.” I have often wondered why they don’t just put them in their own separate category as non-dinosaur and non-bird animals. How Have Young Earth Creationists Responded to Feathered Dinosaurs? 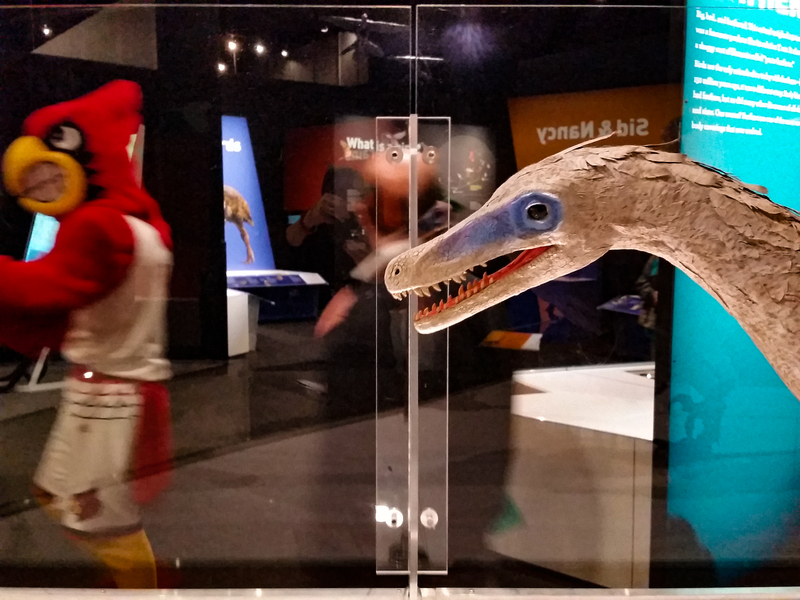 Below are a few pictures from the exhibit that show what paleontologists now believe that many birds and bird-like dinosaurs may have looked like in the Cretaceous Period. 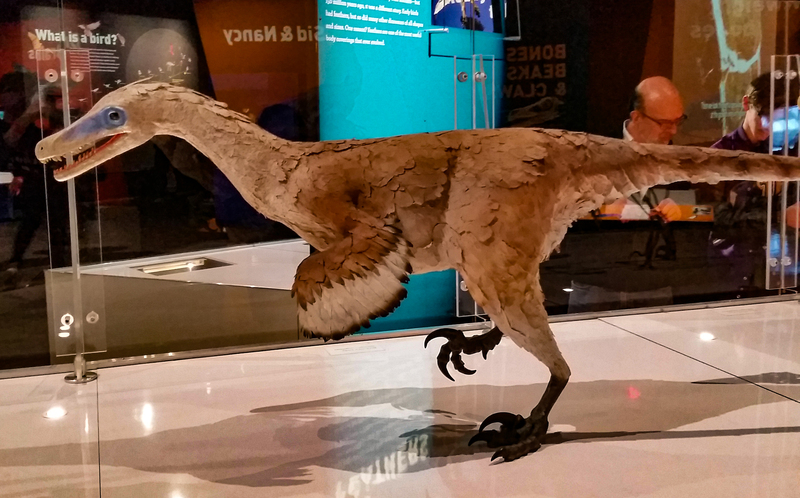 Note the long claws on the wings of this feathered theropod dinosaur. On the left is a turkey-like ancient bird. Photo: Joel Duff at CoSi in Columbus OH. Jurassic Park portrayed veloceraptors with scales but the evidence points to a feathery plumage covering most of their body. 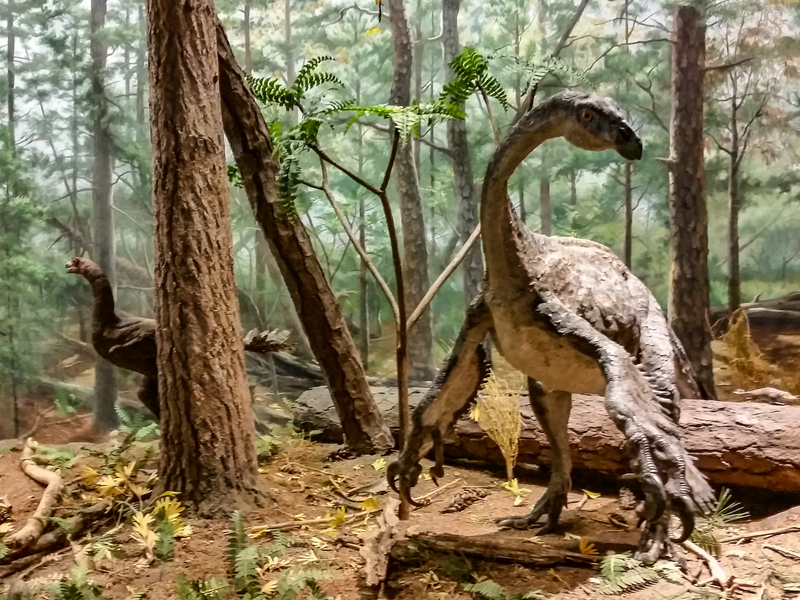 This is Velociraptor mongoliensis at the American Museum of Natural History display at CoSi in Columbus OH. Photo: Joel Duff. The argument that if birds are descended from dinosaurs, then we shouldn’t find birds and dinosaurs in the same strata, and is exactly like the argument that if we descended from monkeys, why are there still monkeys. Yes, the irony in Lacey’s article for AiG is that AiG tells its followers that that monkey argument is invalid but then they don’t recognize when they turn around and reuse the same argument for other groups. I see it all the time. Also, the Homo naledi fossils may be the most recent example of massive taxonomic confusion among YECs. I find it rather ironic that Lacey would make such a claim, given that there exist today monotreme, marsupial and eutherian mammals, all at the same time, even though each group group has diverged considerably from their its common ancestor with the rest. Though if they regard these three as different “types”,or collections of “types”, which assuredly they do, they don’t have a problem. Indeed: why are there still bacteria? Well, closer to Sam Gamgee than to Milton, but I hope you enjoyed my little ode to bird evolution. Just wanted to tell you how much I appreciate your work, and my day lightens up when I see you’ve posted something. Cheers. The thing with Answers in Genesis they make mockeries out of real science and real research; my roster on Issue Five of The Ethereal Gazette are being mocked by this so what I am commenting on is an interesting observation. I had got in touch with Kara Cooney who is out of UCLA who became a contact on linkedin as I asked how could one illustrate visually how young earth creationists piss out Col 2:8 when they’re issued actual research?